Dusk to Dawn Choruses is the first iteration of Julien Grossmann and Song-Ming Ang’s research into the various forms and definitions of the chorus. From the ancient Greek chorus to modern telecommunications companies (Chorus Limited), and from morning birdsongs (dawn choruses) to the humming of Chorus Motors (Borealis Exploration), the project is a musical journey into what a chorus could be. 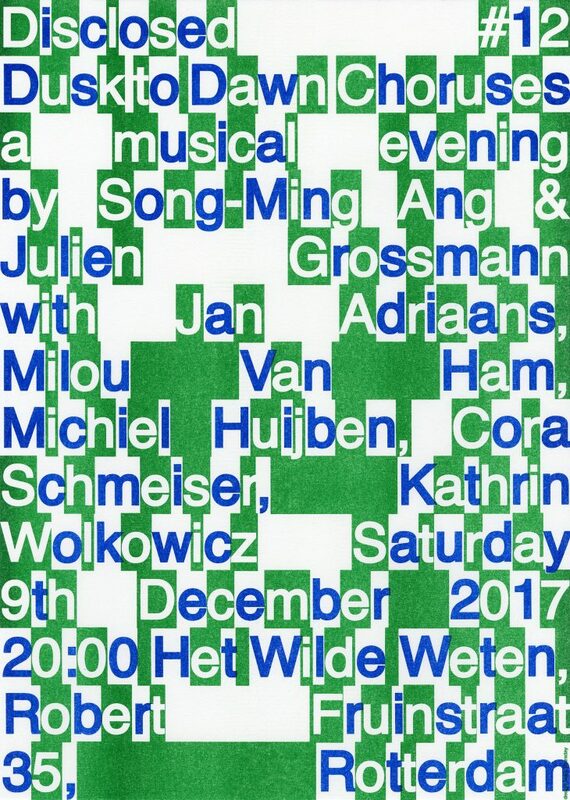 The outcome of a five-day workshop with an ensemble of five performers from Rotterdam, the evening’s program features a range of musical experiments based on instructional scores and compositions in which the voice occupies a central place. Dusk to Dwan Choruses is part of the public program DISCLOSED initiated by Het Wilde Weten, which will run throughout the coming two years. Het Wilde Weten consists of sixteen artist that have a studio in the former nunnery at the Robert Fruinstraat. Every six weeks one of the members hosts a public event that derives directly from their artistic practice. This results in lively series of talks, exhibitions, screenings, performances and more, disclosing the energy and pluriformity of the collective and creating public moments to meet and interact.